With the authorities scrambling to improve industrial safety measures, Rep. Lim Lee-ja of the main opposition Liberty Korea Party on Wednesday released data that showed subcontracted workers at power plants are vulnerable to industrial accidents. According to figures Lim received from the Ministry of Employment and Labor, 20 workers killed at power plants -- Korea South-East Power, Korea Western Power, Korea Midland Power, Korea Southern Power, and Korea East-West Power Corp. -- between 2014 and last year were subcontracted workers. A total of 327 industrial accidents were reported at the five power plants during the cited period, involving 348 injured and 20 dead. Among those injured, 97.7 percent, or 340, were subcontracted workers. 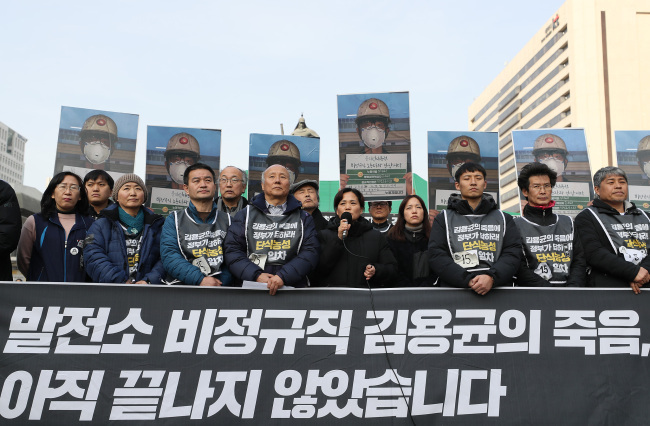 In late December, the death of Kim Yong-gyun, 24, triggered debate on the hazardous working conditions of irregular workers. Kim had joined Korea Engineering & Power Service in late September, seven months after he was discharge from military service. He was killed when he became stuck in a conveyor belt on Dec. 11 while checking equipment at a power plant in Taean, South Chungcheong Province. Images of Kim’s belongings -- including a flashlight and batteries, which he purchased at his own expense, three instant ramen packages and a bag of chips with traces of coal dust -- prompted public outrage, sparking calls to improve the working conditions of irregular workers. Amid the public uproar, the government and ruling Democratic Party on Tuesday agreed to convert some 2,200 subcontracted workers at power plants to regular workers and to merge five power plants into one public agency. It added a special investigation committee would be launched to look into the reasons leading to Kim’s death and to come up with preventive measures. To prevent industrial accidents, public agency chiefs will be held accountable for severe accidents regardless of the employment status of affected workers. “Please think of this (Kim’s death) as a personal matter and create a safe work environment where ordinary people can work without having to die. I think no more lives should be lost like my son. This has to end here,” the late Kim’s mother said in response to follow-up measures rolled out in the two months since Kim’s death. The latest move at the National Assembly came on the heels of the amended Industrial Safety and Health Act, also known as the Kim Yong-gyun bill, which will take effect in January 2020. The first revision in some 30 years contains stricter punishment for main contractors who violate safety and health-related regulations. According to the amendment, owners whose work places have seen more than two deaths within five years are to receive tougher punishment. The maximum penalty for companies will be set at 1 billion won ($893,270), up from the current 100 million won. The amendment, however, was met with opposition by 338 professors, who called it “embarrassing” for failing to include minimal jail time for owners in the case of deaths caused by industrial accidents. “It will be difficult to prevent a second and third Kim Yong-gyun with the current revision. The biggest problem is it does not include practical measures to place greater responsibility on business owners. Subcontracts that push workers to death should be banned,” said the Korean Professor Union and Professors for Democracy.